It makes no sense to me that people spend so much money to get to Italy and then go cheap on the experiences that they went there to have. Our private tour made Rome so much more enjoyable! We were picked up at our hotel by Serena from Eyes of Rome. Admittedly it was January so crowds were not bad, but we just walked right into everything as if we were the only ones there. Serena was full of enthusiasm and knew so much about the city and its history and sites. We had a wonderful experience. I was traveling with my parents (age 77) and she was so accommodating and considerate of them. We've had other good experiences with Eyes of Rome and Viator. I plan to use them again. Made the experience great for the family and went out of the way to ensure we had the time we wanted to. Couldn’t have worked out better for our entire family. Gianluca was an excellent tour guide with a lot of history knowledge on various areas. We liked the private tour unlike those big bus tours with guides who hold up flags and signs! and having the ability to ask questions and stop whenever we wanted to.... We even stopped in for a nice gelato break where there was a breeze on a hot summer day. 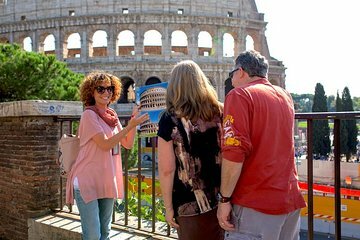 I highly recommend the private tour by Eyes of Rome Storytellers! Fabia was a great tour guide. She was prompt, prepared, personable, and knowledgeable. In my group we are all ages and everyone greatly enjoyed her. The tour was informative and at a good pace. We racially loved the Collesseum! Our guide, Roberta, was extremely knowledgeable regarding the history of the forum and the colosseum. Every question that we posed, she had answers and knowledge. Her English was extremely good and we could understand her perfectly. She was at out hotel promptly to pick us up and got us a taxi back to the hotel at the end of the tour. I recommend this tour early in the morning because the crowds were not in the forum and they were just beginning at the colosseum. Plus it is very hot in the sun . The tour is a little overpriced, in my opinion, but we enjoyed having a private guide. Wonderful experience. Expensive but individual attention from a well-informed guide. A great way to see the colosseum and Roman Forum. MARTA WA LOVELY THE TOUR WAS FANTASTIC. Fantastico! Our guide, Maria, was bubbly, fun, and an archaeologist who works on the Forum. Talk about insider's knowledge! She picked us up at our hotel and was a knowledgeable, enthusiastic guide for our entire time together. She made the Colosseum and Forum come to life, showing us the important features and explained how they were used Ancient Rome, what happened to them over time, and the work that has been done to bring them to what we saw that day. She carried visuals and books that showed us what the places looked like in their prime, which helped a great deal. She walked us up to the Palatine Hill, showed us the Circus Maximus, took us through the Forum, and then helped us with suggestions for the rest of our trip. A wonderful, educated guide and we couldn't have been more pleased with this fun and highly informative tour! Great guide. Great experience. Recommended.